Poetry in Limerick is set to get a higher profile next month as The Limerick Writers’ centre and Quay Books in Arthurs Quay Shopping Centre welcome ‘April is Poetry Month’ in the city. 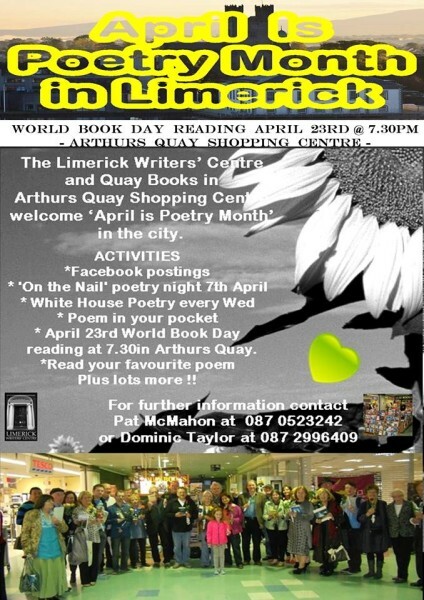 A host of activities are planned throughout the month including the ‘On the nail’ Literary gathering in The Loft Venue on April 7th and continuing on throughout the month with regular gatherings such as the White House Poetry Night taking part, all culminating with a special celebration of World Book Day on April 23rd in Arthurs Quay Shopping Centre where Pat McMahon of Quay books will be distributing roses with every book bought on the day. A special reading will take place that night in the Centre with local poets reading and reciting their favourite poems. World Book Day is marked in over 100 countries and the idea originated in Catalonia where it has been traditional since the medieval era – on April 23rd (St. Jordi’s Day) – for men to give roses to their lovers and for the women to give a book in exchange. The idea is to have a touch of inspiration from Catalonia right outside the Quay Books bookstand in the Arthur’s Quay Shopping Centre on Thursday April 23rd… celebrating World Book Day with books and roses. As it’s a Catalonian tradition special place has been reserved for Catalans or Spanish people who want to read from the vast array of poetry from the Iberian peninsula. UNESCO has celebrated World Book on 23 April for 17 years now. UNESCO Member States around the world celebrate the power of books to bring us together and transmit the culture of peoples and their dreams of a better future. This April you can partake in this feast of poetry, a continuing resource of hope, passion and peace which shines light on our glorious, but troubled world.